Add the chicken, buttermilk, and 2.5 oz of Bravado Spice Ghost Pepper & Blueberry Hot Sauce to a bowl and mix well. Cover and refrigerate for at least 4 hours. Remove the chicken from the fridge. Take one piece at a time gently shake off the excess marinade and dredge in the flour. Again gently shake off the excess flour and place in the hot oil. Fry for about 10-15 minutes or until the chicken is golden brown. Sprinkle with a little extra salt. In a separate bowl, mix the remaining 1.5 oz of Bravado Spice Ghost Pepper & Blueberry Hot Sauce with the maple syrup. 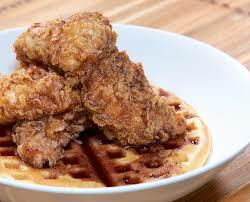 Serve the fried chicken on top of the waffles and top generously with the hot sauce & syrup mixture. Enjoy!